Often lost among the state’s most common attractions, Ogden is one of Utah’s hidden gems that has its own unique experience to offer. The city boasts a rich history mixed with a recent modern makeover. When space became available in one of Ogden’s historic buildings, the Kiesel building, there was no question that it was perfect for England Logistics’ newest office. England Logistics’ Ogden office is located on the corner of Kiesel Avenue and 24th street, right in the heart of downtown. As celebration is one of our core values, we’re always looking for ways to unwind and commemorate daily wins. Fortunately, there are plenty of options located near our new office. 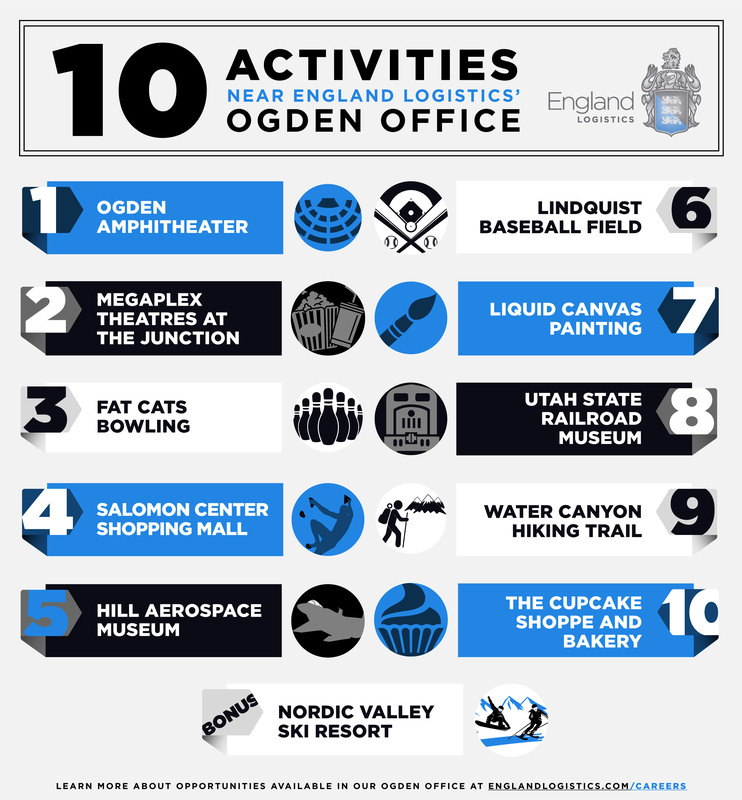 We’re sharing ten Ogden activities available within 15 minutes of England Logistics’ office, all easily acceptable for an afternoon break or after a day at the office. Happy adventuring! You can find something to do at the Ogden Amphitheater during any season, whether you’re stretching during Yeti Yoga at the Yeti Bash or kicking back and enjoying an outdoor movie night. Just take a walk down the block to find out what outdoor entertainment is currently available. During the warmer months, we recommend enjoying some live music at the Ogden Twilight Concert Series after work. Check out the latest blockbuster at Megaplex Theatres just across the street. Meet up with friends and family after a day at the office to enjoy some popcorn and a movie. What better way to end the day? Don’t forget, tickets for any movie are on sale for $5 on Tuesdays! Grab your team for a friendly bowling competition at Fat Cats. You don’t even need to get in your car to let loose and knock down some pins at this bowling alley across the street. Practice your bowling and chow down on some pizza with Fat Cats’ $5 Monday Special. Don’t worry, we won’t judge you for using the bumpers. Hang loose on the Flowrider, reach new heights on the iRock or free fall on the iFly all while visiting the Salomon Center. If you’re craving an adventure on a tight schedule, this is the place to be. Who knows, an adrenaline rush may be exactly what you need to inspire your success back at England Logistics. Get a close-up view of some of the planes and jets that served in the United States Air Force. With several exhibits to choose from, visitors can learn more about Air Force history and Utah’s role. We recommend visiting the inspirational Utah Aviation Hall of Fame where you can read the stories of many local heroes. Bring your peanuts and Cracker Jacks to cheer on the Ogden Raptors minor league baseball team. Many professional players started out in Raptors uniforms, and there could be more on this season’s roster. Whether you catch a game at the end of the workday or get some fresh air during an afternoon game, cheering on this local team is a great addition to your day. Cultivate your creativity and take a class at Liquid Canvas. Students can attend a class almost any night of the week and learn to create a masterpiece. What better way to unwind than at the art studio? Learn about Utah’s railroad history by touring around the Utah State Railroad Museum. Home to artifacts and exhibits related to the transcontinental railroad, visitors can stretch their legs and learn about an exciting time in Utah’s history. There’s even an exhibit titled Golden Ages of Motorcars that features vehicles from 1901-1930 if you’re a vintage car fanatic. Take a hike to get an incredible view of Utah’s iconic mountains and an amazing waterfall. For a short adventure, hikers can climb up to the Bonneville Shoreline Trail from this trailhead while still enjoying nature. If you have more time to spare, the complete Waterfall Canyon Trail is 2.4 miles out and back, and the trail name doesn’t disappoint with a stunning waterfall at the end. Treat your sweet tooth with a trip to The Cupcake Shoppe and Bakery. Take a quick walk down the street (or have GrubHub deliver) to enjoy a cupcake, cookie, macaroon or other yummy treats. There’s always something worth celebrating with dessert in our opinion. If you have a little longer to spare for more Ogden activities, Nordic Valley Ski Resort is only 30 minutes from our office. Perfect for enjoying fresh powder, Nordic Valley offers ski, snowboard, snowshoe and Swiss sled bike rentals. If you’re a beginner, no problem. Take a lesson with a seasoned skier or snowboarder. Whatever adventure you choose, this is the perfect spot to get some fresh air and enjoy winter.